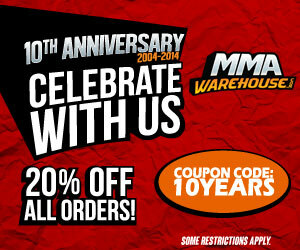 Wolfslair MMA is one of the best Mixed Martial Arts training facilities in the United Kingdom. Some of the top fighter train out of this camp, including Michael Bisping, Cheick Kongo, Paul Kelly and superstar “Rampage” Jackson. Just in time for Michael Bipsing’s war with Wanderlei Silva is the Tapout Wolfslair T-shirt to commemorate the top training camp in the UK, which Michael Bipsing has been a significant part of. The Wolfslair T shirt features, of course, the British flag front and center. But the most unique part of the design is a Wolf’s snarling face busting out of the flag center. It’s symbolic of the intensity and energy that the Wolfslair MMA camp is known for. 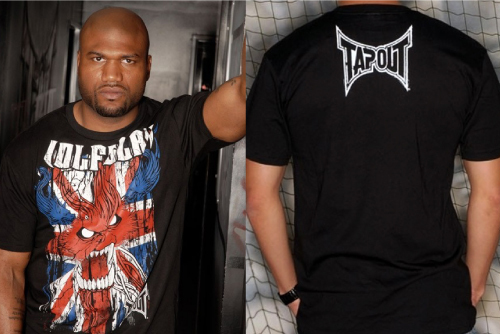 Above is a picture of Rampage modeling the T shirt, that guy is a natural!